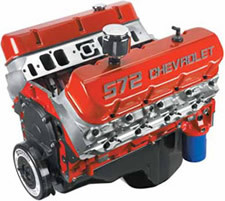 The ZZ572/620 long block Includes all the features of the Deluxe, fully-dressed version, minus the water pump, arburetor, intake manifold, distributor and spark plug wires. Order all the parts to complete the engine from your GMPP dealer or finish with your custom parts. The 620 features rectangular port aluminum cylinder heads that deliver 9.6:1 compression ratios in a pump-gas friendly package. A hydraulic roller cam with 0.632" lift drives the stainless steel valves. Chromemoly retainers, roller rocker arms and dual valve springs help make the valvetrain virtually bullet-proof. Requires additional parts (not included).